This wedding photograph was taken at Tess and Wayne’s wedding breakfast. It doesn’t have much of a focus point, but that’s what I like about it. Your eyes can move around the frame from one person to the next, from one in-between moment to the next and from one story to the next. It’s not often that you have an opportunity to take a wedding photography group shot candidly and with this many people in inside of a venue, but Tess and Wayne married at Clifton Nurseries and held their reception in a glass house, so the light was good enough to create this shot, even though it was early evening. I like that you can weave your way around the picture. 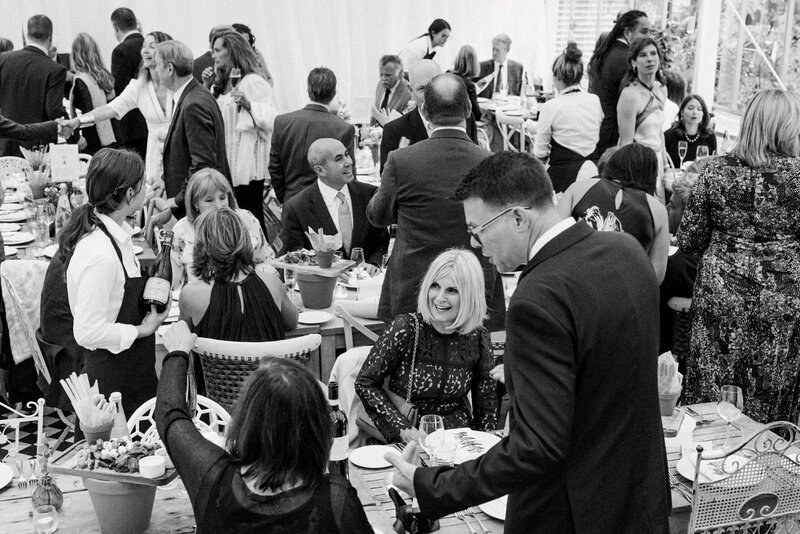 One person reaches for wine, conversations and introductions are happening, someone is looking at something outside of the picture and you can feel the buzz of a wedding breakfast that’s about to start. I also love that most of the frame is in focus. I have been trying to work more with wide depth of field recently, to create more layered images. All in all I like the energy of this frame. The start of the wedding breakfast and the buzz of guests saying hello to their neighbours, pouring wine, sitting down and getting ready to welcome Tess and Wayne, the newly married couple.